This product is not available in our online store. Please call 513-621-1052 or click here to contact us for purchasing information. 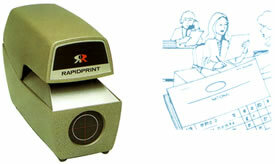 Rapidprint has been a leader in the development and production of automatic date and time stamps for over 60 years. 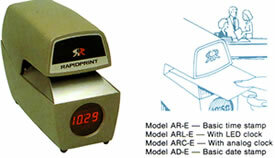 Whenever you need a printed record of time and date, a Rapidprint automatic time stamp can do the job. Simply insert the form, document or letter for an instantaneous time-date imprint. For imprinting a variety of time, date and message combinations. Print automatically when paper is inserted. Solid-state electronic circuitry assures consistent impressions. Adjustable stamping force for multi-copy forms. Easy change ribbons advance and reverse automatically. Rugged die-cast case has a sturdy lock to prevent tampering. Solid brass typewheels provide superior imprint and durability. Machines print automatically when paper is inserted. Solid-state circuitry assures consistent impression every time. Adjustable stamping force for multi-copy forms. Easy change ribbons advance and reverse automatically. Rugged die-cast case, sturdy lock to prevent tampering. Solid brass typewheels provide superior imprint quality. 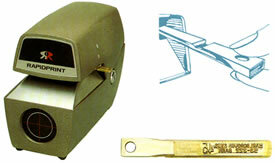 Whether date only or time and date, these special units are designed for validating bank documents. Individualized removable dies are engraved with teller number or other identification. Each user is responsible for his/her plate, These plates can be used on any -RST machine, allowing tellers or other operators to change work stations. Perfect for whenever sequential numbering is required. Many options available for your application including, duplicate action, repeat switch and code wheels. Solid-state circuitry controls both the number advance and assures consistent impressions. These models stamp a number each time a document is inserted, then advance automatically. Ask for model ADN-E if both the date and sequential numbers are needed. Solid brass typewheels provide superior imprint quality. Prints a 6 digit automatically advanced number on the same line as the date and time. An LED clock reads out time in red numerals on a black background. 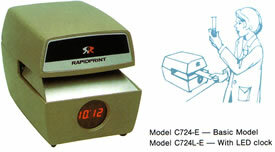 This is the most versatile Rapidprint machine in its possible applications, and also in that it can accept any combination of the type sections we offer. Solid-state electronic circuitry for consistent impressions and trouble free use on any AC outlet. Solid brass typewheels provide superior imprint quality. Allows the busy executive to delegate check signing with complete confidence. It is impossible to operate the machine without twokeys, and the case lock prevents tampering with the signature die (which can be removed by key and locked up for safekeeping). A separate switchlock prevents an imprint from being made by an unauthorized person. In addition, a visual counter records the number of times the machine is used and can be reset only when the case in unlocked. An adjustable guide locates the signature precisely. Other wording can be printed with the signature.